A Storms River type suspension bridge across the beautiful Kromme River at St Francis Bay in the Eastern Cape has at last become a reality, following its final ratification at month end by the local Council. Photo: The suspension bridge at the Storms River mouth in Tsitsikamma National Park, taken in December 2013 by Stephan Schulz. Big anticipation is already mounting among those few ‘in the know’, but excitement could well reach fever pitch by most residents in St Francis Bay the moment the bridge is opened for the first time, enabling them to cross over and see the other side, which very few have ever done, given its inaccessibility. The extremely strong currents at the mouth would sweep those, who would attempt to cross, swimming or wading over at the mouth, out to sea. A few boats have, however, taken runners or walkers across a few times. The EIA for the suspension bridge, which was part of the EIA study for the Sand River Bridge and linked into the same project, was passed at the same time as the Sand River Bridge EIA. This is according to the building company, Suspension Bridge Services, which has had vast experience building suspension bridges and it assisted as a subcontractor in the building of the 3 km Mocambique suspension bridge. Contacted yesterday, a spokesman for the company, Johnny Bravo, spoke briefly about this project. The approved design will be a steel cable suspension 95 metre bridge with a wooden walkway suspended below, 5.5 metres from the water. 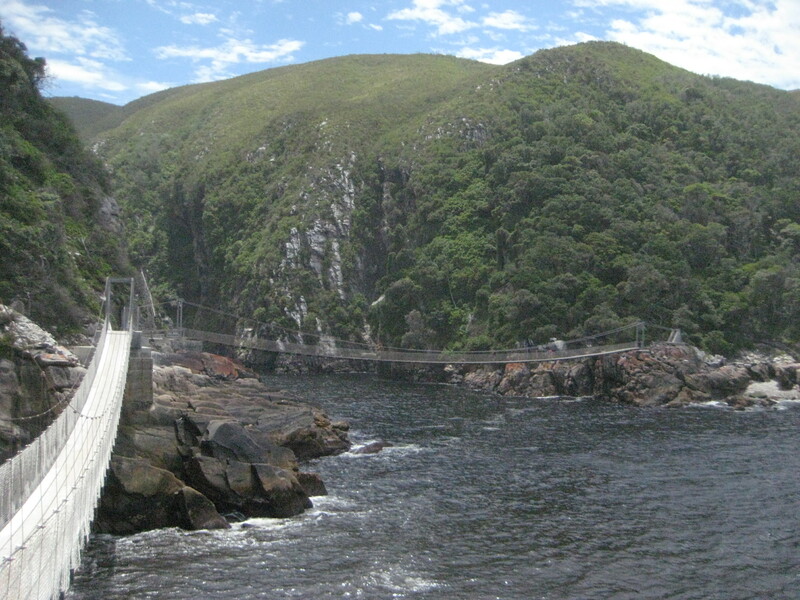 The suspension bridge will function similarly to the existing suspension bridge over the Storms River Mouth. Construction will start next month and 8 concrete piles, with a diameter of 250 mm, will be driven 16 meters into the sand, 4 on each side of the Kromme River Mouth, onto which the suspension bridge will be anchored. Hand guide cables, side protection and the wooden walkway etc, will all be fitted before the bridge is connected and stainless steel fittings used wherever possible. Bravo maintains the bridge will be a tourist attraction for the area. His sentiments have been echoed by a few people the St Francis Chronicle contacted this weekend, asking for comment. Most believe the bridge will give access to the unspoiled beaches on the northern side of the river mouth creating a tourist haven for St Francis Bay residents and visitors. The early response is that more money will flow into St Francis Bay, which will enable the town to flourish and develop more. Bravo also said it is planned to have a gate on both sides (locked at night) manned by gate keepers who will collect entrance fees and single or return fares. The income will enable the developers to maintain, upgrade and improve the bridge and some of the income will go to St Francis Tourism. Chairman of the local tourism body, Peet Kemp, is delighted at the news. “This will be a major tourist attraction for the greater Kouga region. “Our local tourism office, with funding received from Kouga Municipality, will be building a Tourism Info Centre on the St Francis side of the bridge,” he says. “A small section of the centre will be dedicated to the bridge, including a 3D model and tactical information and photos. Tourism development could also bring new employment opportunities for the local population,” Kemp adds. Other happy pundits spoke briefly about all the possible activities the bridge could present to St Francis residents, such as, enabling locals and tourists to go to the beach on either side, enabling hikes and runs to JBay and nature lovers to see the other side, particularly the newly declared private Krommensee Nature Reserve announced last year. Not everyone is jubilant though. The Kromme Enviro Trust is appalled. “After all the hard work behind getting areas listed as Nature Reserves and protecting these areas, this is now thrown at us!” the Trust’s spokesperson, Warren Manser, laments. Manser says the Trust has investigated the bridge development with the private land owners, Kouga Municipality and others, but is still awaiting a full response. The two nature reserves, the Kromensee Nature Reserve and the Sand River Nature Reserve at St Francis Links are not fenced with game fencing. At the official launch last year the two reserves were announced as not open to the public, but permission could be obtained for visitors with permission of the owners. The Kromensee Nature Reserve, owned by Krommensee Ontwikkelings, is a most diverse area that includes sensitive ecological features, such as a network of primary coastal sand dunes, a perennial dune stream, and a pristine coastline that extends all the way from Paradise Beach to the Kromme River estuary. Bravo said the bridge design took into consideration the environmental conditions due to the proximity of the sea, the fact that future maintenance will be minimal and that the bridge can endure all tidal conditions. Bravo was unable to provide drawings or architect type impressions for the bridge as he was not at the office yesterday, but did say he could email photos today, on the 1st of April. This has to be an April Foolâs day joke?